The "411 On Fishing" : Marks Mailbag - Should I Jig or Should I Troll Now! Marks Mailbag - Should I Jig or Should I Troll Now! 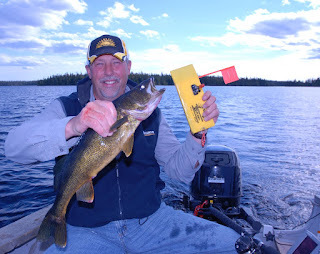 On April 6th, Tim wrote - Hey guys, what is the biggest factor when deciding whether to troll or jig on a lake? 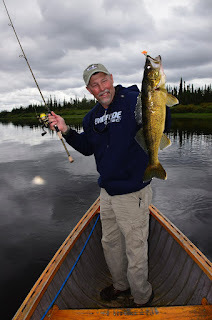 this July my family and i will be fishing walleye just east of Longlac Ont. We have fished this lake this time of year with mixed results. Thanks for all you do for the fishing community! Thanks for writing. What you’re asking is the always controversial question should I jig or should I troll? Often the best answer depends on what time of year an angler will be fishing. In this case your family is heading to the Longlac, Ontario region in July. At this time of year a transition is occurring. 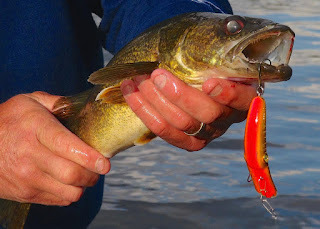 Prior to July most of the walleye will have been found feeding primarily in water less than 10 feet deep. The tips of points, weed edges, saddles between islands and rocky shorelines are all good places to search for early season walleye. sunken islands, reefs and other mid-lake structure. Since most lakes in this region will not be mapped, the only practical way to find these mid-like humps and bumps is to cruise back and forth setting up a grid pattern to break down the lake basin and use sonar/GPS to confirm the location of fish holding structure. When one of these spots is located, save a GPS coordinate even if the spot isn’t currently holding fish. Often fish show up at these spots for no apparent reason. Having a “milk run” of spots to check will ultimately help tremendously in your day to day search for walleye. If you have a Lowrance HDS sonar/GPS you can use a feature called Insight Mapping to actually record your own lake map to a Mini SD card. This information is then viewed on the plotter screen of your GPS unit and can also be shared with other anglers using HDS sonar. When you locate structure that is holding fish, how these fish are relating to the bottom structure will dictate which fishing presentation is going to be the most effective. If the fish are tight to bottom and concentrated on key spots on the spot, sitting directly over top of the fish and jigging is going to be deadly. If on the other hand the fish are scattered along bottom, slow trolling using a 2-3 ounce bottom bouncer/spinner rig is going to be a more efficient means of targeting and catching these fish. realize that walleye suspend even in natural lakes. If you mark fish suspended in the water column trolling over the tops of bottom structure using crankbaits and planer boards is likely going to be the best approach. When I find suspended fish in Ontario it’s usually a mix of both northern pike and walleye. Thanks again Tim for your question. The short answer is to be prepared to both jig and troll. No single fishing presentation works every day and on every body of water. Be versatile and you’ll find and catch more walleye.